TPI ET5 Series Line voltage heat thermostat in white color, is rated at 120 - 277-Volt AC and 22-Amps. 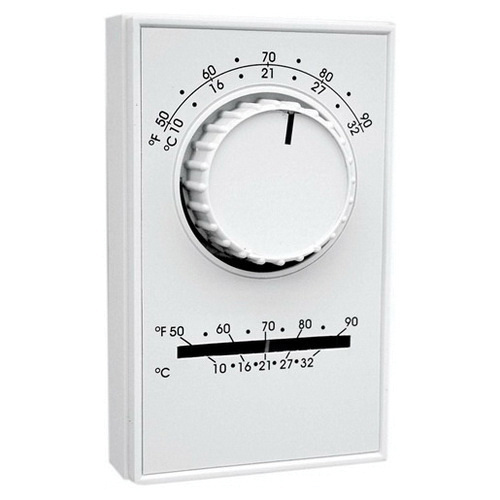 Thermostat with DPST contact configuration, features Celsius and Fahrenheit temperature scale. It has a dimension of 2.8-Inch x 1.5-Inch x 4.75-Inch. It has a power rating of 3/4 hp at 125-Volt AC or 1.5 hp at 250/277-Volt AC. Thermostat with positive off, withstands temperature range of 50 to 90 deg F. Wall mountable thermostat is ideal for indoor use in residential, commercial and some industrial applications. Thermostat is UL listed and CSA certified.